We all have a line. It is invisible. You may not be aware of your line, or think much about it. But, you know when someone has crossed that line. Everyone’s line is in a different place. Take the recent scandals of sexual misconduct. Harvey Weinstein’s behavior crossed nearly everyone’s line. Al Franken’s crossed some people’s lines, but not others. Not everyone’s line is constructed the same, either. For some, their line is narrow, neatly drawn, and very black. Everything on the one side of the line is good, and everything that crosses that line is bad – full stop. For others (myself among them), their line is rather wide and contains all of the gray areas. On one side is good, and on the other bad – but there is considerable space within the line for those things that are less clear. Using my example above, it is in my line’s gray space where Al Franken falls. Distasteful behavior, yes. Clearly not good, but not really in the class of “bad” into which Harvey Weinstein and others fit. But, this post is not about the #metoo movement. My question to you is – where is your line when it comes to horses and riding? Let’s try a little exercise in deciding where your line exists, when it comes to a topic popular in Dressage discussions – the horse being behind the vertical. Does it cross a line for you? Would it matter if this was just one moment, versus a repeated position? Is there any information lacking for you to make a determination? Hopefully at least one of these images crossed a line for you. Perhaps all of them did. I would guess that if all of our lines were drawn it would look rather like a line of cavaletti! Many factors may have gone into your determination. Perhaps signs of force was a consideration? Perhaps the horse’s expression played a role? Or perhaps your knowledge and training guided you on what is correct or allowable? Was there any additional information that would have helped in your deciding whether an image crossed a line? Would it make a difference if you saw the rider? Or the whole horse? Or a video, to determine if it was just a moment? It certainly is a challenge to make a robust judgement based solely on a photo, let alone part of a photo. But it also makes an interesting exercise in analysis – even if that includes what information you think is missing. For me, the first image clearly crosses a number of lines – not just that of when or if being behind the vertical is allowable, but also the amount of force that should be allowed in training – especially when riding at the level of using a double bridle. Purely on the merit of the images as presented, Image 5 would be the least problematic for me. However, here is where additional knowledge can change your perception – the rider in that image is well known as one of the original users of rollkur, a method illustrated in Image 2. 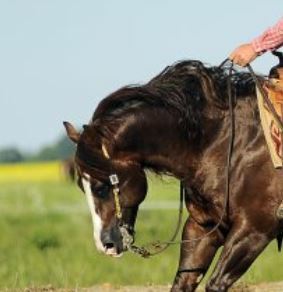 Ridden long enough this way, and a horse will hold the position on even a loose rein (Images 3 and 5). By contrast, Image 4 is more problematic – the uneven arc of the neck and the pressure on the reins (bit even pulled out on the side) being key in my assessment – yet that rider is well admired for being a classical style trainer and rider. Would knowing who the riders were have changed your opinion? We are highly susceptible to the cult of personality. Liking or admiring someone can suddenly make our lines rather fuzzy – or absent all together. Going back to the sexual misconduct scandals, many people have gone on record as saying the women should be believed – until, that is, allegations have been made against someone they like, admire, or need support from. For that one instance, their line changes. Their standards are lowered. I see this all too often in the horse world – behavior that is abhorred in others, is tolerated in our trainers or heroes. I have seen people passionately defend riders in several of the images above (including image 1), as well as other famous riders, because they like or admire that person – and in the next moment they are condemning riders from another country or “school” for the very same (and sometimes less egregious) practice. This is why the question of what criteria you used to judge the photos is important. If you are clear on where your line is, and why it is at that point on the scale, then you have a checklist of criteria. This can help you be truer to your own standards when viewing those you admire. Try to set aside your personal feelings about the person, and isolate those qualities that you use to set your line. Noting the flaws in something a person does should not lead you to like them less. No two people will ever agree on absolutely everything (and if you are in a relationship like that, you might want to take a closer look!). So, be willing to take what you like from someone you admire, but equally willing to recognize and acknowledge where the flaws are. One last modifier for where your line might sit is context. What might be acceptable, or at least tolerable, in one situation might be completely unacceptable in another. This is where the “behind the vertical” question lies for me. 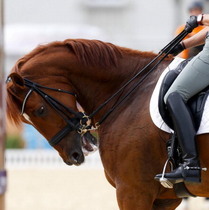 From a Dressage perspective, it is acceptable only as something that may happen for a moment in the course of training, but should be immediately corrected. It is a warning sign that something is going off-track in the work, and an assessment should be done by the trainer to determine the cause. Yet, I have known scores of horses who spent their show careers working with their faces behind the vertical. Most of these horses led long productive lives, with no signs of physical damage from this posture. 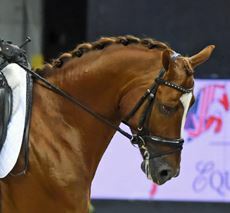 However, they generally traveled in a longer frame than is typical for Dressage, and weren’t asked for anything more complicated that walk, trot, canter, and slight variations in speed within those gaits. The demands of Dressage make a posture that is behind the vertical far more damaging – both physically and to the end result of self-carriage that we are trying to achieve. Given context as a factor, the image of the Western horse, above, would be the least problematic, with no other information provided. I chose the topic of “behind the vertical”, and all of its various forms, because it is currently a topic of heated discussions online. I could have just as easily picked any of a multitude of topics for which there is a range somewhere between universally acceptable and universally reviled. Whatever the topic, find where your line is – don’t just adopt someone else’s line. Educate yourself, create your own set of criteria, and be consistent in how you apply it, no matter who is involved. You owe yourself and your horse that kind of honesty. 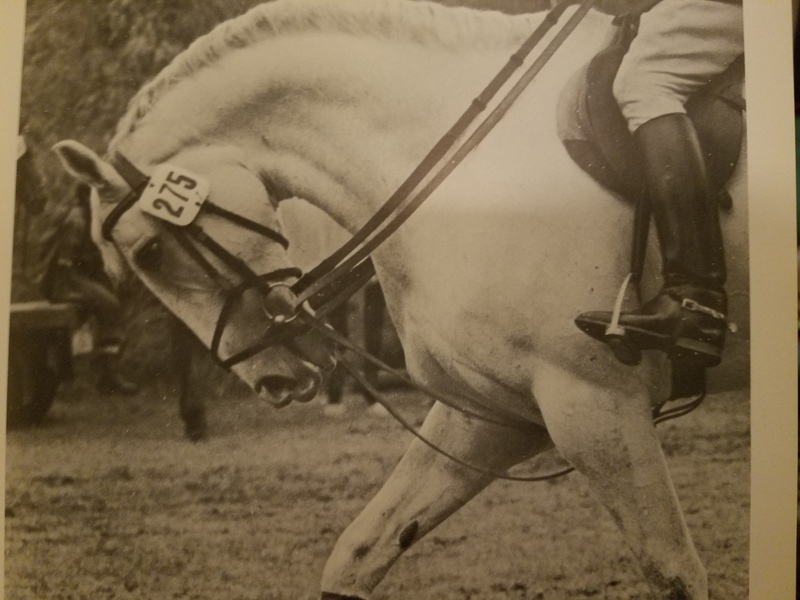 This entry was posted in Classical Training and Philosophy, Horsemanship, Thinking Out Loud and tagged developing your eye, Dressage, Horse training, LDR, rollkur, setting standards. Bookmark the permalink. 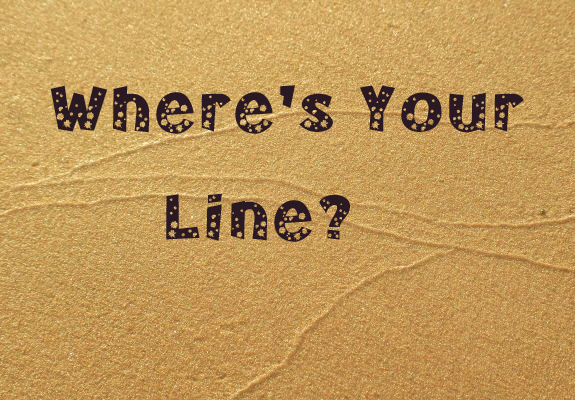 8 Responses to Where is your line? And, that last image makes me cringe. Let me guess, Elinor – it’s the expression in that pic? I would put it down to “just a moment” but for the horse’s eye. What a well written article Lia. Riders need to understand you can create a beautiful athlete without the use of unnecessary force. If we can all attempt to set a standard in Dressage riding instead of walking away from it, maybe something can change. As long as trainers are providing these methods and riders think it’s ok, and Judges are rewarding with high scores…..we do need more articles like yours attempting to compare with something people can relate to. Obviously they aren’t listening to their horse. I sometimes think that people don’t see or “hear” their horses because they have been taught to be blind and deaf to them. We need to turn that around so they can learn to listen to the horse. It is our only hope for the long term survival of the sport … and the horse! Good post and it asks some important questions! I find some of the images dreadful ( 1 and 2) and could they be moments? Maybe. The whole rollkur debate has been raging for some time. It really does not seem necessary to me to have a horse curled up in that tight a frame. 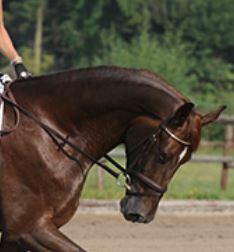 I ride at an advanced level of dressage and I have never found it necessary and neither have the coaches I train with. Both my coaches are respectful of the horses. To me the whole point is to try to have the horse want to work with me, not for me to force them into doing it. The first image is one of hundreds you can find for that pair. 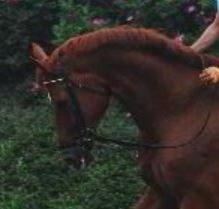 The second is one of two riders who made that style of training fashionable in jumping, decades before it hit Dressage. Sadly, moments like those two are rarely just isolated moments. Sadly, it became quite fashionable for Dressage, especially in some countries – but people are slowly recognizing the issues with it. Fortunately i do not see it in the warm up rings in Canada or. Florida. Maybe it is done at home but not out in public. It definitely seems to be much more deeply seated in Europe.